This weekend is one of those long weekends in the UK which result from having a Bank Holiday – yay! I have had a lovely quiet weekend because my husband has been away partaking of his hobby on a racetrack at Castle Donington. So what do I do when he is away – well this weekend I planned absolutely nothing! It is glorious to be able to wake up and do just what you like with no-one getting under your feet. Apart from the cat, that is. So we (the cat and I) have done just as we like. Naturally this involves a little crafting (crochet) but it also includes a little gardening (pruning), rather a lot of tidying (I have moved my craft room around for the 3rd time in a year – I think I need a bigger room), an unusual amount of cleaning (I cleaned all my kitchen cupboards and threw out lots of items that were chipped, cracked or just plain useless) and plenty of RnR. Ok, I confess the crochet wasn’t exactly ‘little’. The May instalment of the Kaleidoscope mystery blanket came out this weekend, so I spent Saturday evening in front of the television watching all 6 episodes of the BBC’s Pride and Prejudice back to back, with crochet hook in hand and cat cuddling next to me (except on several occasions when said cat decided the yarn was the best play thing in the world, even the decoy ball of acrylic I always have handy wasn’t good enough for her!). 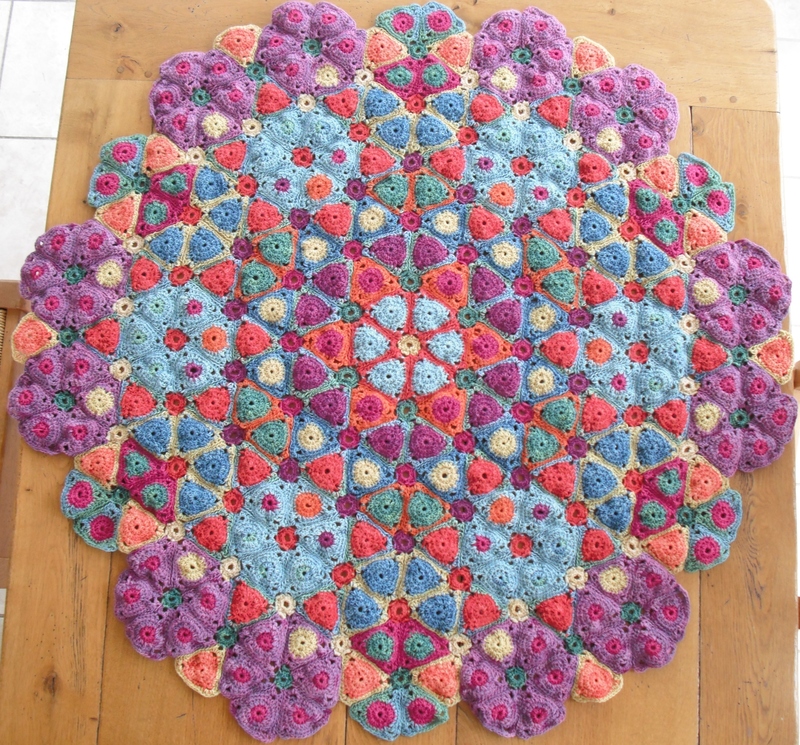 Sunday night wasn’t quite so intense but did involve crochet, as did Monday (a bit in the morning and another bit in the afternoon) – so I have finished May. Part of this drive to finish May was because I was expecting the Janie Crow mystery blanket instalment on 5th May (why oh why did I challenge myself to do 2 mystery blankets?) and had to finish Kaleidoscope before it came out. Except I made a mistake – the next Janie Crow instalment comes out on 8th May – so I have 3 days yet. Ah well, maybe I should do some knitting………! Oh I envy you your weekend. In fact, I envy you so much I may try to work my $@$Q% off today and tomorrow and mimick you this weekend. With crochet, garden, cat and all 🙂 Thank you for the inspiration.